[Editor's Note: Once again, Substance's BOARDWATCH feature is publishing the remarks prepared and delivered by the speakers at the monthly meeting of the Chicago Board of Education. 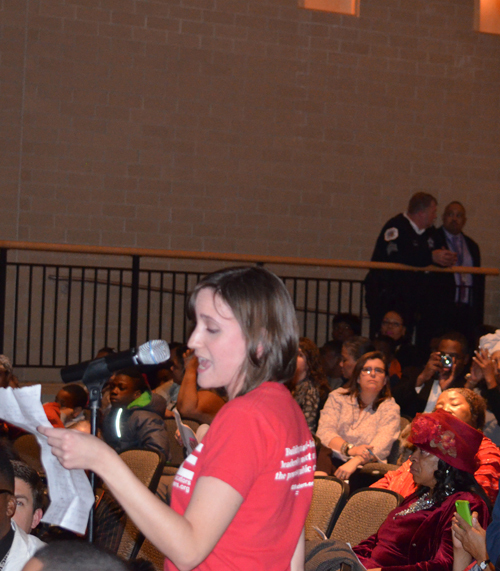 The meeting of November 19, 2014 saw more than 500 people present for the meeting in the auditorium at Westinghouse High School, with 60 people signed up to speak. The following material was prepared by Sarah Chambers and provided to Substance by her. George N. Schmidt, Editor, Substance]. My name is Sarah Chambers, and I am a special education teacher from Saucedo Academy. At the beginning of the year, every kid is given a REACH Performance Task. Board, members, I have a question for all of you: What do you think is the reading level for the 5th grade REACH performance task? According to the Flesch Kincaid Readability Index, the reading level of the 5th grade REACH task is 12th grade reading level. Why would you all make a 5th grade test at a 12th grade reading level? 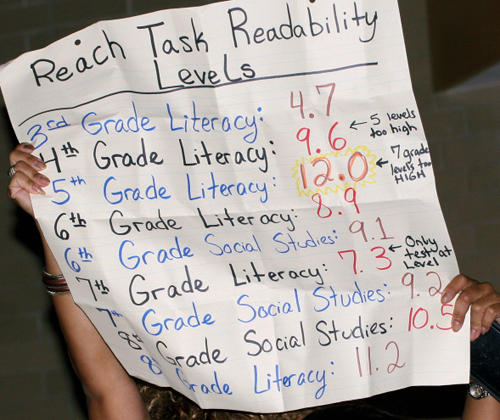 What is the 4th grade REACH task�s reading level? Any guesses? It is a 9th grade reading level. Why would you all choose to make the test so hard that it is impossible to pass? You are setting up our children to fail! You are setting them up to fail, so you can label schools as failing, close our public schools in black and brown communities, fire our experienced teachers and privatize our schools. You are about to vote on a motion to pass $649,000 for the Value Added Measures on these tests, which are proven to fail our students. If you truly do not want our students to fail, you will remove these unfair assessments and tell Illinois that we will not take the PARCC assessments, just how most other cities in this country have said no to the PARCC. If ISBE denies your demand, I know some people who could teach you how to boycott. 5th grade literacy- 12.0 Poor kids!! 7th grade literacy- 7.3 Only test on grade level!